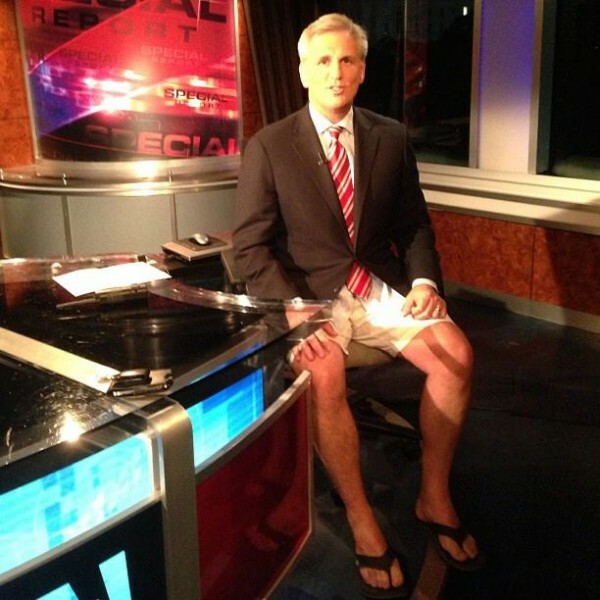 I recall sitting in my office in the U.S. Senate’s Hart Office Building in DC between 2008 and 2010 with my desk TV always turned onto one of the cable news channels when the Senate was not in session. Incessantly, I saw TV ads from the U.S. Chamber of Commerce speaking as the “voice of small business” attacking Democratic efforts to achieve national health reform and universal coverage because of the harm it would cause small business. Only later, in 2011, did we learn that the entire tab for that endless advertising campaign was paid for by major U.S. health insurance companies and their trade association, America’s Health Insurance Plans (AHIP) to the tune of more than $100 million in direct donations. Later, I had the chance to ask AHIP President Karen Ignagni (who recently stepped down) why these donations had never been disclosed. “Because no one ever asked us,” she replied. Those watching the U.S. Supreme Court process on the King v. Burwell suit that almost upended insurance subsidies for about 6.4 million Americans knew that three outcomes were possible – 5-4 for the plaintiffs, and 5-4 or 6-3 for the government. That indicated to me a two-thirds probability of a pro-Affordable Care Act ruling. Intellectually, that’s what I expected. Too many long-standing and widely-shared judicial precedents would have been trampled by a ruling for the Libertarian/Cato Institute’s lawsuit – including the core Chevron principle that “context matters,” and the Pennhurst principle that federal laws shall not “surprise states,” among others. With a ruling the plaintiffs, the Court’s only way out would be to repeat the 2000 scandalous ruling in Bush v. Gore that the Court’s decision installing George W. Bush as President would represent no precedent for any future case. My favored definition of “health policy wonk” is someone who reads health reports from the Congressional Budget Office AND enjoys it. Guilty as charged. 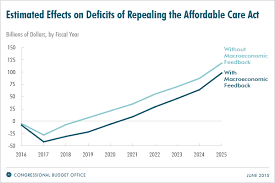 Last Friday’s new report, “Budgetary and Economic Effects of Repealing the Affordable Care Act,” was enlightening and fascinating. It will be a benchmark document during the coming two years of debates over the ACA’s future — and required reading for my students this fall. Lucky them! This report is already a fountain of numbers thrown around by both parties — and it reflects the changing politics at CBO under Republican control of the U.S. House of Representatives and the Senate. What are the key numbers? Repeal would increase the US gross domestic product (GDP) by 0.7% between 2021-25, with “substantial uncertainty” regarding this estimate in both directions. One proposal to change the Affordable Care Act would repeal the law’s 2.3 percent tax on sales of medical devices. On June 2, the Ways and Means Committee of the House of Representatives voted, once again, to rescind the tax and a vote in the full House is expected soon. Even progressive Democrats such as Sens. Elizabeth Warren (D-MA) and Al Franken (D-MN), who hail from states where the medical device industry is strong, support repeal. But repeal is a bad idea on principle and impact. If Congress insists on repeal, they should at least demand something in return for the public, namely, an end to the medical device industry’s secrecy clauses and gag rules. The medical device tax is one of many revenue increases included in the ACA so that the law does not increase the federal deficit. Pegged at $29 billion in new revenues over ten years, it embodies a principle called “shared responsibility.” To achieve comprehensive health reform, every system stakeholder contributes something to make reform succeed, and nobody gets off the hook. Who else pays? Insurance companies, hospitals, home health agencies, drug companies, businesses, labor unions, hospices, consumers, tanning salons(!) – just about every constituency connected to health care pays something to achieve the coverage and system improvements in the law. 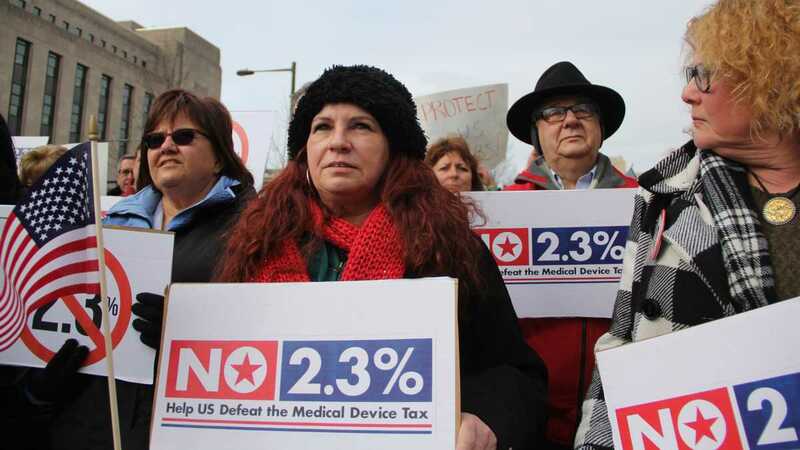 The medical device tax has been in effect since January 2013 with no disastrous effects. More than 75 percent of it is paid by the largest 1 percent of firms such as Johnson & Johnson and Medtronic. (J&J actually opposes repeal.) But the medical device lobby has focused on repeal like a laser beam gaining support among Members of Congress to accompany their tens of millions of dollars in campaign donations. Today, President Obama spoke to the Catholic Health Association, the nation’s organization of Catholic Hospitals, about the progress and success of the Affordable Care Act. It’s just under 29 minutes and, in my humble opinion, it’s really worth your time to view, especially in the stories he tells of individual citizens whose lives have been rescued by this law. Please give it a look and I don’t think you will regret it. President Obama takes his lumps every day, and I’m proud to have him as our President. It’s been nearly 5 and 1/4 years (63 months for those counting) since President Obama signed the Affordable Care Act into law. Since then, Republican Congressional leaders have continually declared their intentions to advance their own plan to repeal the law and replace it with something else. This took on new urgency this year because of the U.S. Supreme Court’s (SCOTUS) decision to hear the King v. Burwell lawsuit that would eliminate all insurance subsidies to ACA private coverage enrollees in the 34 states with federal — as opposed to state — run exchanges/marketplaces. New federal data show that 6.4 million would lose their insurance subsidies if the Court rules for the plaintiffs (King) and against the government (Burwell). All this year, Republican lawmakers in the Senate and House have been insisting they would have a replacement plan out and even scored by the Congressional Budget Office before a SCOTUS decision in late June (an assurance made by House Ways and Means Chairman Paul Ryan (R-WI). US House Majority Leader Rep. Kevin McCarthy (R-CA). Now, House Majority Leader Kevin McCarthy (R-CA) has announced the Republicans will have no replacement plan to unveil until after a Supreme Court decision is released, expected late this month, and Senate Republicans are stating the same. As Jon Cohn notes in the Huffington Post, not only is there no plan, Republicans have not even held a hearing on the matter — though they repeatedly berated Obama Administration officials, notably Health & Human Services Secretary Sylvia Burwell, for having no contingency plan in the event of an adverse ruling in the King case. “What about Congress? [asked Supreme Court Justice Antonin Scalia] You really think Congress is just going to sit there while – while all of these disastrous consequences ensue?” The Solicitor General responded “well, this Congress, I ….,” a response which generated laughter. Some may quibble and point to a number of ACA replacement bills filed by various members. None of them have even received a committee hearing, much less a committee markup, or a vote in either chamber. The most prominent replacement proposal, the Patient CARE Act, from Sen. Richard Burr (R-NC) and Orrin Hatch (R-UT) and Rep. Fred Upton (R-MI), which has had two public unveilings since 2013, has yet to be translated into legislative language and sits as a well-trumpeted narrative description of a non-existent bill. I believe it’s pretty plain what is happening here. Republicans are quite capable of uniting around what they all oppose and quite incapable of uniting behind what they would propose as an alternative. With firm control of the House and Senate, the GOP has a golden opportunity to advance a comprehensive and clear alternative to the ACA. They just can’t do it — short, medium, or long term — it’s a bridge way too far for them. A bridge to nowhere. Is the “Triple Aim” a Part of the Problem? 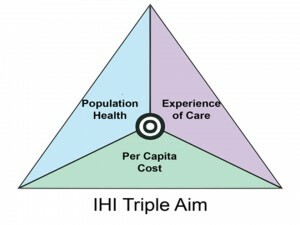 One can look at the Affordable Care Act and see the Triple Aim model at work in numerous places. The key notion behind the Triple Aim is to ask: what are we trying to accomplish in the U.S. medical care system and where are we trying to go? A quick Google search will give some indication of how far and wide the concept has traveled over the past 7 years, including well beyond U.S. borders. 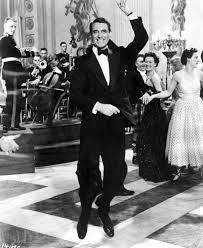 It is a global phenomenon. Author John McDonoughPosted on June 1, 2015 Categories Health Policy, National Health PolicyTags ACA, Affordable Care Act, Institute for Healthcare Improvement, Not Running a Hospital, ObamaCare, Paul Levy, Triple AimLeave a comment on Is the “Triple Aim” a Part of the Problem?